Welcome back. If you were following this blog last December, thank you; but more to the point, you may recall my post on the voracious appetite of spiders for insects (Spiders’ Sumptuous Repast) -- i.e., why we should appreciate spiders. It’s come to my attention that that post went unread by those who cringed at the sight of the photos and possibly at the first word of the post’s title. Well, today, you have a chance to catch up. What follows is a photo-less synopsis of that study to introduce my review of a recent study led by the same investigator. Instead of estimating the weight of insects consumed annually by spiders, the new team of researchers estimated the annual weight of arthropods (insects, spiders and crustacean) consumed by birds. 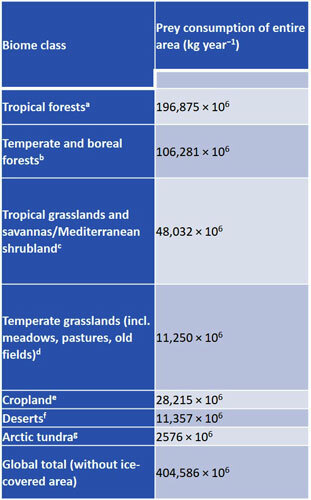 For the earlier study, the researchers first tapped the literature to obtain spider biomass (weight per unit area) worldwide and in seven terrestrial biomes: (1) tropical forests, (2) temperate and boreal forests, (3) tropical grasslands and savannas, (4) temperate grasslands (including old fields, permanent pastures, mown meadows) and Mediterranean shrublands, (5) annual cropland, (6) deserts and (7) Arctic tundra. Next, they took two approaches to estimate the weight of prey spiders kill annually--one based directly on published assessments, the other based on how much food spiders need. For the recent study, the research team from Basel University, Switzerland, Koç University, Turkey and Utah and Illinois universities followed essentially the same steps. Measure of Birds--They first estimated the biomass of insectivorous birds in each of the seven biomes, modified only by shifting Mediterranean shrublands from temperate grasslands to tropical grasslands and savannas. They defined insectivorous birds as all bird groups whose diet has a considerable percentage of arthropods at least temporarily. This included omnivorous birds that consume large amounts of arthropods in addition to other types of food. Bird biomass was assessed by calculating the product of mean bird density, derived from the literature for the different biome types, mean bird body mass, also from the literature, and area of each biome type. Measure of Arthropods Consumed--Next, they estimated the weight of arthropod prey per unit area that the birds consumed annually in each biome type. Estimated weight (kilograms) of arthropods consumed annually by insectivorous birds in different biomes (from link.springer.com/article/10.1007%2Fs00114-018-1571-z). Estimates were derived from 103 prey consumption values from three sources of literature: published values, energy demand estimates and, for desert and Arctic tundra, estimates of daily energy expenditure and breeding bird densities. Combining biome estimates of bird biomass with estimates of the weight of arthropods per unit area that the birds consumed annually produced the global estimate of 404.6 million metric tons. This estimate does not include food consumed at stopover sites during fall and spring migrations, which the researchers estimate would add 3 to 5 million metric tons per year or about 1% of the total weight of arthropod prey consumed. 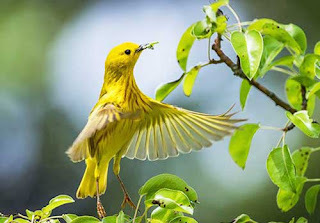 The study found the global predation of insectivorous birds (400 to 500 million metric tons per year) to be of the same order of magnitude as that of spiders (400 to 800 million metric tons per year). The greatest impact of both occurs in forest biomes. Although other insect predators like bats, frogs and lizards may exert high predation pressure in some biome types, their global impact falls far short of that of spiders, birds or insects that feed on other insects. I hope this post makes up for the spider post. Thanks for stopping by.